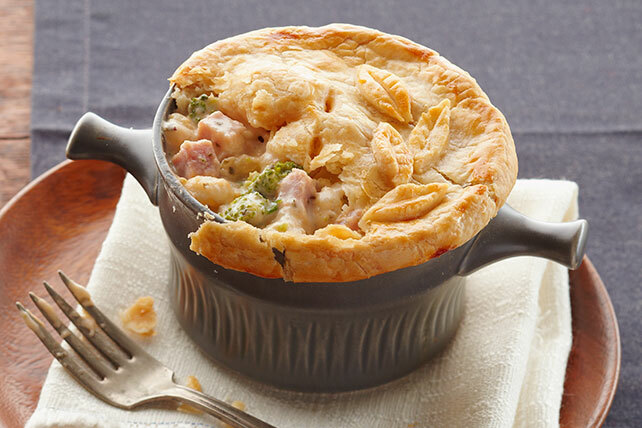 Make a creamy, restaurant-worthy Ham Pot Pie with Cheese and Veggies! You only need 15 minutes of prep time for this Ham Pot Pie with Cheese and Veggies. Unroll pie crust on lightly floured surface; roll to 12-inch circle. Cut into 4 rounds with 5-inch cookie cutter. Cut leaves from about 1/4 of the trimmings with small cookie cutter or sharp knife; discard remaining trimmings. These individual pot pies have built-in portion control so you can enjoy this classic comfort food as part of your balanced diet. Prepare recipe as directed, substituting 1-1/4 cups chopped cooked chicken for the ham. Omit pastry cutouts on tops of pies. If you don't have a 5-inch cookie cutter, invert a 5-inch-diameter bowl or clean can onto pastry; trace around edge with small sharp knife. Repeat to cut out the remaining 3 dough rounds.